Nintendo is offering 3DS owners a free digital copy of one of the most creative Zelda games ever made. 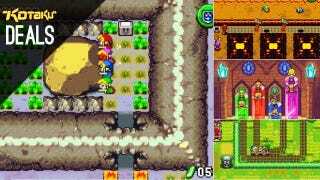 The Legend of Zelda: Four Swords Anniversary Edition is free on the eShop (U.S. and Canada only) until Sunday, and the GBA classic has even been updated to support local wireless multiplayer, which is critical if you want to have four Links on screen at once. The best mouse Luke Plunkett has ever used is back on sale today for just $41. Last time we saw this on sale, it didn't last long, so click fast. FX Eleven ($15) | Steam | New release, 25% Off. The Gala Store has More Than 70 Games from Nordic Games Discounted 60% Off. Activate on Steam. Gog.com is having a Wargaming Weekend Sale. 70% Off Blitzkrieg Titles, Etherlord Titles, and Many More. DRM-Free.